Mask the area with ¾-inch painter’s tape approximately ¼ inch above and below the seam you want to caulk. 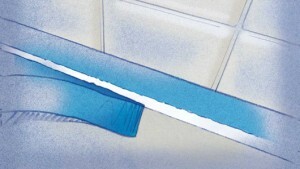 Apply the tape as straight as possible, and press down the edge so no caulk can bleed below it. 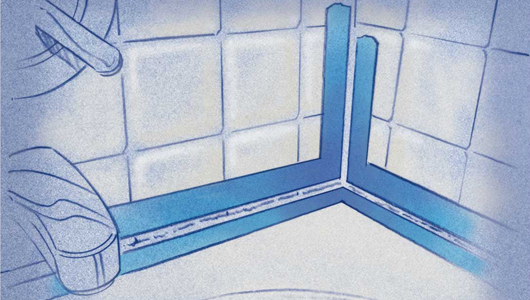 For removing and replacing silicone caulking, start by removing as much as silicone caulking you can with a paint scraper, razor or a caulk removal tool. Be careful not to damage the surface. After you scrape off as much of the old caulking as you can, apply a caulk removal product, following the manufacturer’s directions. It won’t dissolve the silicone, but it will make the caulk softer so you can scrape more away. You can get the same result by soaking paper towels with mineral spirits and covering the caulk with the towels. Then cover the paper towels with plastic wrap for an hour or more. Scrape the seam again and you should be able to remove more. Next, apply a thin coat of the caulk removal product all along the seam. Leave it the recommended time and then scrub the area with a Mr. Clean Magic Eraser. It will also help remove scuff marks left by the razor or scraper. Dampen the Magic Eraser with water and rub. Problem: It appears the old caulking is gone, but how can you be sure? Rinse off the caulk removal product completely and dry with a cloth or paper towel. If you used mineral spirits, wash off the paint thinner using a product such as Simple Green and then rinse the area with clean water and dry. Brush a small amount of a fine powder, drywall joint compound or flour work well, on the seam. Rub the powder with your finger and it will embed itself in any areas that still have softened caulk on them. Mark the spots (a piece of masking tape works) and apply the caulk removal product just to those areas. Scrape with a plastic scraper. Repeat to be sure all caulk has been removed and allow the area to dry completely before applying the new caulk. 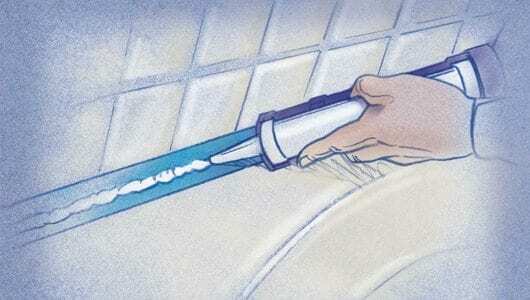 Problem: If caulking is not your specialty, try this. It takes a little more time, but the result will be worth it. Caulk the joint and run a dry finger along the seam so the bead of caulk is uniform in size. Remove the masking tape and the overflow of caulk will come with it. Mask the area with ¾-inch painter’s tape approximately ¼ inch above and below the seam you want to caulk. Apply the tape as straight as possible, and press down the edge so no caulk can bleed below it. Caulk the joint and run a dry finger along the seam so the bead of caulk is uniform in size. Remove the masking tape and the overflow of caulk will come with it. Allow the new caulk to rest a few minutes, then “finish” the bead by dipping a finger in a 50/50 solution of liquid dishwashing detergent and water and running it along the joint. The soap will prevent it from sticking to your finger, while creating the shape you want. Continue to dip your finger in the solution and run it along the seam, until the entire area is uniform. If you remove too much from an area, reapply caulk and shape it. It will stick to the new caulk that has the soap solution on it. Allow to cure overnight. 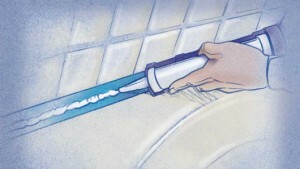 Before resorting to removing mildewed caulking, try this. Mix baking soda with straight bleach to make a paste you can spread along the mildewed caulking with a putty knife or spoon. Cover the paste with strips of plastic wrap to keep it from drying out and leave it overnight. When you remove the plastic wrap and wash away the paste, the stain should be gone. If it isn’t, repeat.